We abide by the laws and regulations set forth by the Swedish Consumer Agency for online shopping. In our webshop there are three payment alternatives. 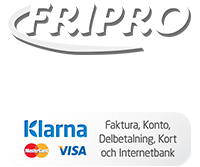 As a privat citizen you can use PayPal or Klarna Checkout. When using PayPal you can choose to pay with yout credit card either with or without a PayPal account. Klarna Checkout offers card payment using VISA, Mastercard & American Express, 14 day invoice, partial payments 3-36 months and direct bank transfer via these banks: SEB, Handelsbanken, Swedbank and Nordea. Klarna Business Invoice offers invoice options for companies/organisations. NOTE: All Klarna options are for Swedish registered companies and citizens with Swedish social security number and only applicable for deliveries s to Swedish shipping addresses. We use Postnord for our shipments and send them using registered parcel. This keeps shipment times down and supports tracking which helps in the event of shipment delays. Your order is delivered to the Postnord pickup point closest to your adress for you to pick it up. Contact us for large volume orders. For orders outside of Sweden we accept payments using PayPal. PayPal offers card payment with our without PayPal account. Shipping prices are automatically calculated in your shopping cart before placing your order. If ordering more than 5kg worth of goods, contact us. You have the right to return a defective product up to three years after purchase. In such case the merchandise must suffer from an original fault, even if the fault was not clear initially. Problems during the first six months after purchase are considered to be original faults unless we as seller can prove otherwise. When you return a defective item you are entitled to have it repaired without cost or recieve a new, functional item. If it's not possible to provide a new item you may have rights to price reduction or in some cases cancel the purchase if the problem is severe. If you want to return a product you as the buyer contact us, the seller, via telephone or e-mail. Our contact information can be found by clicking this link. For us to be able to expedite a warranty case you need to supply us with proof of purchase such as a reciept, invoice, credit card slip or bank statement. You always have 14 days right of withdrawal when shopping through our webshop. This means that you have the right to return the merchandise and get your money back within this period. Your 14 days of withdrawal rights begin when you recieve your order. When you exercise your right of withdrawal you must notify us and send the product back to us within 14 days. You, the buyer, are responsible for paying the return shipping fee. You decide what type of transport to ship with, remember that you are responsible for the returned product until we recieve it. Therefore make sure to package it well to avoid it being damaged during the return.